As the picture shows, I used The Deck of 1000 Spreads to demonstrate the positions and my most favorite deck, The Ghosts and Spirits Tarot to explain how Spirit comes through and helps me understand my Tarot reading skills and empathic gifts. As you can see, The Knight of Swords has appeared…Now the Knight, being an Air card or thoughts, ideas and information kinda guy, tells me that when I read the cards, I am sharing ideas and information with my spirit guides and they are ever present when it comes to interpreting Tarot information. The Knight of Swords also cautions me to not jump to conclusions or try to force my interpretations, into making sense. It is what it is and allowing the information to come on it’s own is the whole key to understanding Tarot itself. 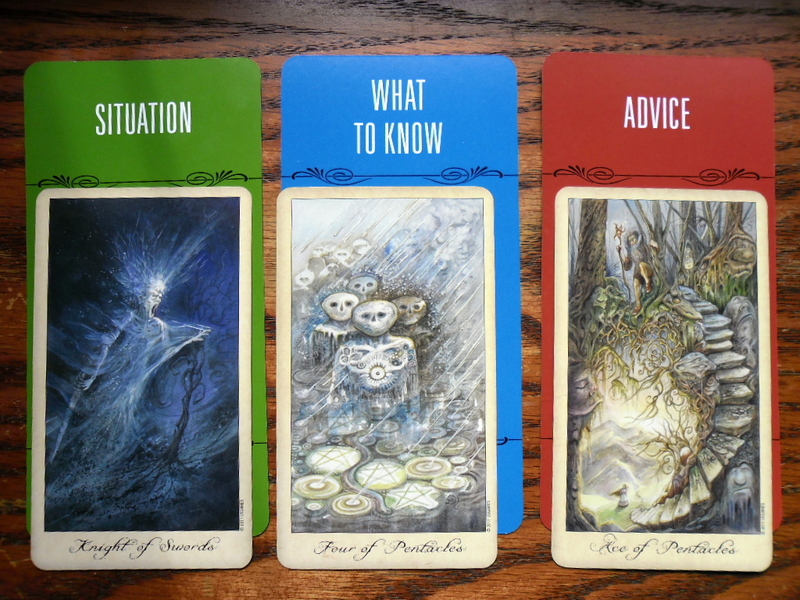 What I need to know, or as I prefer to ask, What do I need to do is The Four of Pentacles. A card all about stability and groundedness. When I look at the cards that I’ve layed down in a spread, I am reminded to always accept the gift of Spirit that flows through me to my reading and not to be too greedy or demanding….let it flow they say, accept this gift for what it is and be thankful. Not too many folks are blessed with the wonderful opportunities that working with Spirit has and it is to be respected and treasured. Their advice? Here we see the Ace of Pentacles….Continue to venture forward with Spirit, embrace the new experiences and new areas that allow you to grow and become the reader you always wanted to be. Don’t allow restrictions that we all find ourselves imposing on ourselves from time to time. This is an ability that must have freedom of expression and it can never be quantified or measured. Who knows, you may just find yourself making a living but more importantly, growing spiritually as well! I hope that young readers out there continue this amazing craft that is Tarot reading, pull the cards and just let their information flow through you!